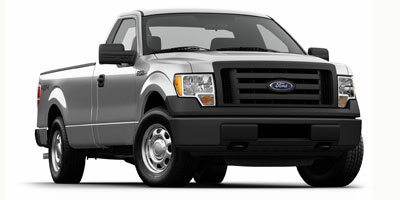 The Ford F-150 hardly needs introduction. The best-selling truck – and vehicle, for that matter – in America for decades on end (only briefly ousted by a few compacts in the Cash for Clunkers months), the many generations of Ford’s full-size pickup make regular appearances on roads around the country. We’re currently celebrating the F-Series’ tenth generation, and while it has come a long way since the first iteration, fans of the successful truck know a winner when they see one. Ford offers it in every variation imaginable, from the base XL to the fully loaded Harley Davidson Edition. There’s even a Raptor model for those who want an SVT-tuned dedicated off-roader. Along with multiple bed lengths and cab sizes, the F-150 has a couple of engine choices, including the new-for-2011 EcoBoost V-6, the real story for the F-150 this year. Using twin turbochargers, the EcoBoost engine promises fuel economy gains without sacrificing power or towing capability. In fact, the EcoBoost’s 420 lb-ft of torque help it achieve the highest tow ratings of Ford’s range of engines available for the F-150, and performance numbers are comparable to the less fuel-efficient 6.0-liter V-8. The extra mpgs may not be enough to convince everyone to spend the additional $4,400, but for the die-hard fuel savers, this should be your go-to truck. The more efficient EcoBoost engine doesn’t require sacrificing towing capacity and still provides plenty of power. Front seat comfort is impressive. Interior styling is all tough, all the time, and we love it. Dual-angle side mirrors will give you plenty of visibility. Sync’s interface gets complicated without the touch screen to help the user through the details, and the instrument panel is too cluttered. No telescoping steering wheel limits the driver’s comfort level. Pricing starts competitively but rises quickly with the many options. 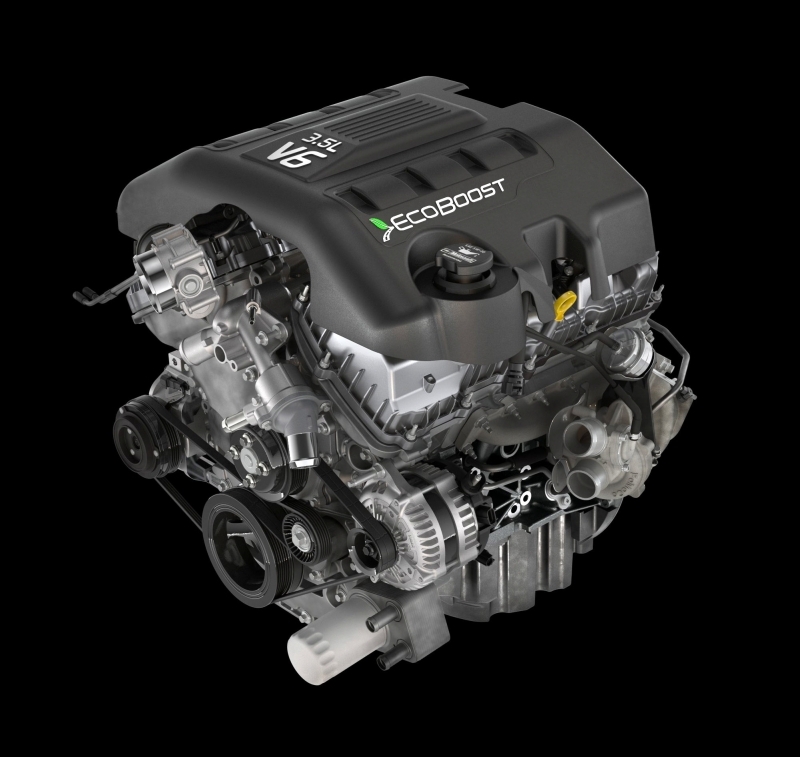 For all its benefits, the EcoBoost only achieves a marginal fuel economy gain over the 5.0-liter V-8 engine. The new EcoBoost engine is the biggest news for the F-150 this year. It’s a twin-turbo V-6 that manages to produce the same range of power as a V-8. The turbos spool quickly, and the truck has considerable acceleration thanks to its diesel-like amount of low-end torque. To speak to its more gentle qualities, the EcoBoost is quiet when idling and easily switches to 4x4 high and low. Steering is too light at highway speeds and there seems to be that uncomfortable, where-are-my-wheels feeling at times. There’s slight pitch and roll, but it’s hardly noticeable. What’s really impressive is the smooth road feel. The leaf springs aren’t going to get the F-150 to a Dodge Ram level of comfort, but they come close – and don’t sacrifice towing capacity either. 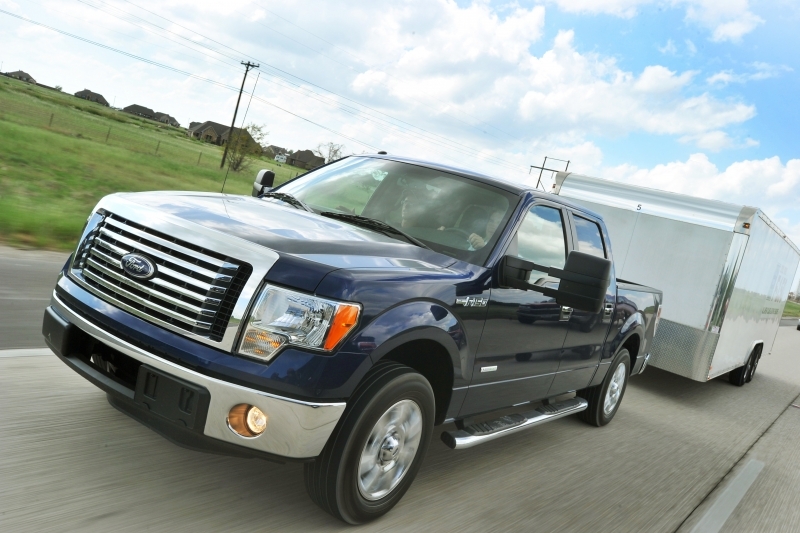 Tow ratings depend on the combination of cab, bed, and engine you opt for, but all things equal, the EcoBoost tows a max of 11,300 lbs and sees nearly identical towing capacities to the 5.0-liter V-8. The twin turbocharged 3.5-liter EcoBoost engine delivers 365 horsepower and 420 lb-ft of torque, sending power to either two or four wheels with the flip of a manual switch. A six-speed automatic transmission is standard. In tow/haul mode, feedback from electronic sensors will brake the engine and increase control of the truck on descending grades. Improved gas mileage is a considerable benefit of the EcoBoost engine. Compared to the 5.0-liter V-8 (which matches its horsepower output), the EcoBoost is slightly more efficient, boasting fuel economy numbers of 16 mpg city/22 mpg highway with two-wheel drive and 15/21 with four-wheel drive, and almost on par with the less powerful V-6. However, it easily bests the 6.0-liter V-8 (with similar torque output to the EcoBoost), which proves to be considerably thirstier – its mileage can dip as low as 12 mpg city. Like most of Ford’s latest vehicle updates, the F-150's newest generation gets the full suite of cool features (though not MyFord Touch… yet). Sync’s voice-activated system lets you keep your hands on the wheel, and a handy 4.2-inch screen located between gauges provides information about everything from current fuel economy to off-road data. An in-mirror rearview camera and centralized navigation system are also available. Quite a few truck bed features are available at the dealership too, such as a cargo management system and a stowable bed extender. The F-150’s interior sports a rugged look, and the hard, durable materials provide a visual representation of “Built Ford Toughâ€. The surfaces are easy to clean and there’s plenty of storage within the cabin. The instrument panel appears cluttered if you don’t opt for the large touch screen, however. Rear seats in the SuperCrew are roomy and fold up to reveal a large amount of cargo space, though their folding capabilities make them a little firm. Ford continues the aggressive and strong look throughout the exterior. The dominating grille is visually impressive, and rectangular headlights and taillights fit the styling. 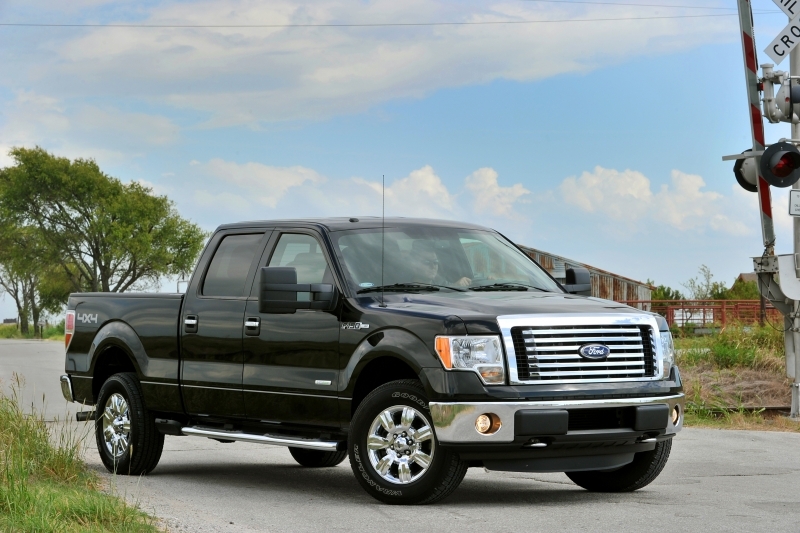 The fog lights and wheels might be the only items on the F-150 that have truly rounded edges. Truck beds range from 5.5 ft to 8 ft and have integrated bed lights and a bevy of available cargo management options. The many combinations available in the truck marketplace make nailing down a specific price is a bit complicated. However, we can tell you that the base F-150 starts at $22,790, the EcoBoost engine bumps up the price by $4,400, and four-wheel drive adds another $4,500. So an F-150 XL with the EcoBoost engine and 4WD is around $32k to start. The Toyota Tundra hits $30k when adding 4WD and a comparable V-8 engine. Chevy’s similar Silverado XFE is also around $30k but doesn’t offer 4WD with the fuel economy package. And lastly, the Ram 1500 V-8 starts around $26k with a fuel saver V-8. The truck segment is a hotly contested one within America, but ask the Ford team who’s number one and they’ll point to the undeniable sales figures. Their F-150 reigns supreme, and the added features aren’t going to slow demand. For this truck, the EcoBoost engine certainly makes sense, and any reason to get twin turbochargers under the hood of a full-size truck sounds good to us, especially if it’s in the name of fuel economy.